This month was a race against time to get the shamba (garden) planted before the long rains began. We are happy to say, we were successful. This month we planted our one-acre raised beds in corn, and also planted another four acres in corn. We will wait until the corn begins to shoot up, and then we will plant all five acres in beans, also. All of this was planted by Friday, and the rains came on Saturday. The students are back at the Andrew Connally School of Preaching. 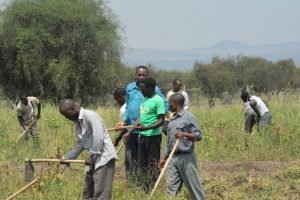 As a part of their curriculum, they are now working in the shamba every Wednesday. 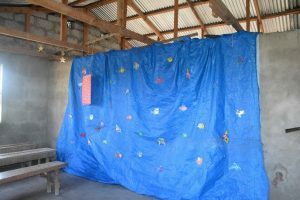 We, along with the school, think this will be a huge asset to them and their villages when they return home. We teach them about all of the different areas (crops, cows, chickens, etc.) in the hopes they will take the knowledge of one of these areas home with them and help themselves and those around them. Justin continues his series on “Church Growth” at the Ilkiurei Kanisa la Kristo. It has been a successful series so far and many of the members have asked Justin for his notes to study further. On Saturdays Justin is also continuing to teach classes for the teens at Kisongo Kanisa la Kristo. The teens have asked him how to evangelize to their friends and as a result, this subject has been their focus. Every Thursday, Justin, Daniel, and some of the guys from the Shamba are now evangelizing in the community we live in (Kisongo). They are conducting personal Bible studies with the friends and family of our community and we are thrilled for this new opportunity to share the Gospel. One other opportunity the Lord has laid before us came about this month. One of the locals, Nester, conducts Bible studies in the same area as our last children’s seminar. The Pentecostal church is prevalent in this area. Nester had the opportunity to speak to one of the Pentecostal preachers about the New Testament Church. As a result, he asked if Nester would come and speak to his entire congregation. Nester asked Justin and Daniel Gaines if they would come. The first meeting was merely introducing themselves to this man’s church and telling them we would like to conduct a series on Acts and the church of the New Testament with them. This has the potential to be a great evangelistic opportunity and we need your prayers for this effort. Anna taught a lesson, the first Saturday of February, on “Hospitality” to the preacher’s wives. She used the example of Nabal’s wife, Abigail, before directing the lesson toward the book of James. The women were very open and had many questions since this is a subject they struggle with in their culture. Anna also continues to teach the women at Kisongo Kanisa la Kristo on Sunday mornings. They have just finished the book of Genesis and are starting Exodus. It has been a great class and a challenge all in one. Most of the women know nothing from the Old Testament and the class has been challenging as a result. Samantha’s children’s class at Kisongo Kanisa la Kristo has expanded from 15 children the first Sunday in January to over 40 children! They have finished the book of Genesis and are moving through Exodus. She and Anna have been working on Bible material for the women when Samantha leaves. The class will be split up by age. 5 years and younger will have their own class, and those 5 and up will have their own class. The young children will have to meet outside, so when it rains they will all be together like they currently are. This past Sunday they studied Moses parting the Red Sea and were astonished when they walked into class and Samantha and Anna had created a “sea” for them. We are excited that our friend and preacher, Garry Hill, will be arriving this Friday. He will be teaching a short course at the school and teaching a seminar on archeology and the Bible. Samantha will then be returning to the States with him on March 17th. Please be praying for both of them. Also, please remember brother Cy Stafford in your prayers. He has been moved to rehab, and while he has a long road ahead of him we are praying for complete healing.